Serviced offices in Evanston. This office space boasts terrific views of the Chicago skyline and Lake Michigan. 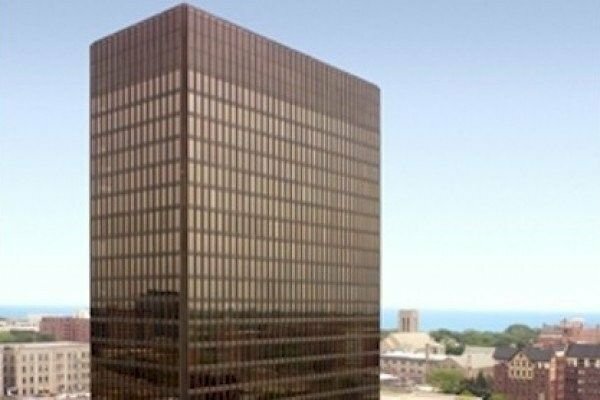 It occupies the tallest office tower (20 stories) between Chicago and Milwaukee - an attractively landscaped international-style block close to all amenities. Downtown Evanston is a successful business community situated north of Chicago on the shores of Lake Michigan, with around 1,450 enterprises employing about 18,950 people within its immediate vicinity. The biggest employers in the city are the nationally renowned Northwestern University, which can be seen from the business center, healthcare, local government, a non-profit service and an employee-owned US alternator manufacturer. The business center is ideally located for commuters, being two blocks from the CTA at Davis Street station, which is also where the Union Pacific North Line stops. One federal and two state highways, including interstate I-94, serve the community, with Chicago O`Hare International the closest airport.